September is the month to embrace all things autumnal including blankets, candles, hot chocolates and sitting in front of the fire. It is also the time to switch up your makeup and skincare routines, and go a little wild buying too many pairs of boots and one to many coats. For me I have really enjoyed September, as I am back at uni for my final year. I have been treating myself to a few things to help my transition in the autumn, and this means I have quite a few favourites this month. First up, the Jo Malone Cologne in Nectarine Honey and Blossom. I got this for my 21st Birthday. It is not what you would class as a traditional autumnal fragrance. But I am not really into woody fragrances, and I always venture towards more fruity scents. This is a sweet scent which is what I really love, it is not too overpowering and lingers beautifully on the skin. As it is a cologne it has such strong scents, and it lasts so long on the skin it definitely out does any of my other perfumes into terms of longevity. Woodwinked is a classic shade from MAC, and I think it was the first ever shade which I picked up from the brand and boy was it a good choice. This is my most used and reliable eyeshadow in my makeup collection. It is the perfect mid toned golden shade, and it is easy to blend with many shades. It is part of the Veluxe Pearl range, meaning it does contain slight shimmer but nothing to overpowering. The texture of these eye shadows are creamy, and super easy to work with. If anyone ever asks me for an everyday eyeshadow recommendation, this is always what I suggest. The Brow Wiz range from Anastasia Beverly Hills was something which I was quite late to hop on the hype too. I wear the lightest shade of the range which is Taupe/Ash Blonde. I was worried that it would be a little too light for my skin tone, as my hair is a dark blonde. On the site it recommends this for platinum to light blondes, but I think it is darker than it suggests which was perfect for me. I love how fine the nib is, meaning you are able to easy replicate real eyebrow hairs. I also love that you get a spoolie on the other end of the pencil which helps to define the overall look. The Zoeva All Over Shader Brush is an excellent brush for easy and quick application of eyeshadow. It is great as you can apply an overall wash of colour to the entire eyelid in one sweep. I also like this for blending into the crease, as the shape of the brush is flat and wide allowing just the right amount of product to be applied. I really need to try more brushes from their range as they are such great value and price. To round up this month's favourite I bring you my most deliberated foundation ever. At first I totally did not get the hype, but after a little perseverance I have started to really quite like it. 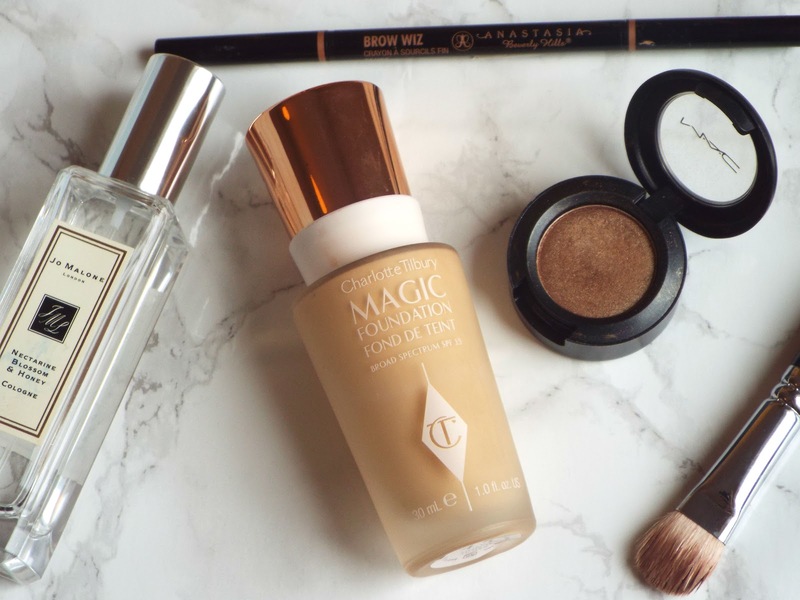 This product in question is the Charlotte Tilbury Magic Foundation. It comes in 15 different shades, I am the colour 4.5 which is a really good match to my skin tone. It is a medium coverage, and blends really well. I do think that it can cling a little to dry patches but with a good base you can overcome this.